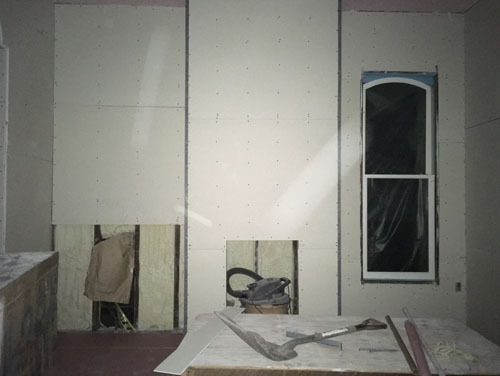 Most of the rocking stage of drywall is done, which is to say that for the most part, the boards of drywall that are going to be installed are in place, and they have moved on to taping. There are a few places where some work remains, but not many. We walked around the house yesterday and I'm going to just apologize here for the incredibly bad photos that make it look like things are more dire at the house than they are. Maybe over the weekend I'll go to the house during daylight and take some better photos. Here are the front stairs. 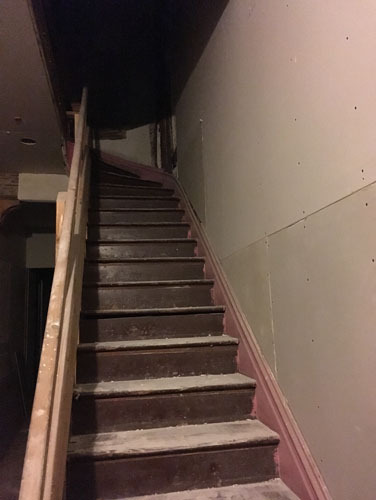 I'm really glad we decided to replace the stair treads because at this point they are literally collapsing from the stress of contractors going up and down them. Four of them have split, which would be much more distressing if we hadn't hired a guy to make us a bunch of new stair treads out of walnut. Here's the front parlour. I think the dust in the air was making it hard for the camera to focus itself, and it had to do its own focusing because it was entirely dark and the only lights in these pictures is from the flash. Anyway, you can see the chimney breast is back, risen from the dead. Not right now, but in the future we will get a nice carved marble mantel and a gas fireplace insert. Until then, we'll block it up with something and be good. Over to the left you see a blank spot. 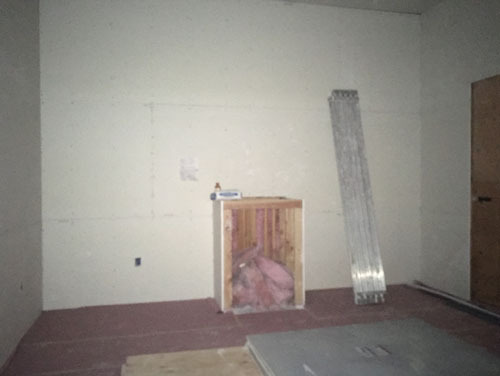 The insulation was not installed there because we are replacing the electrical box on the outside of the house in this location, and that will entail messing with the wiring that comes in here. 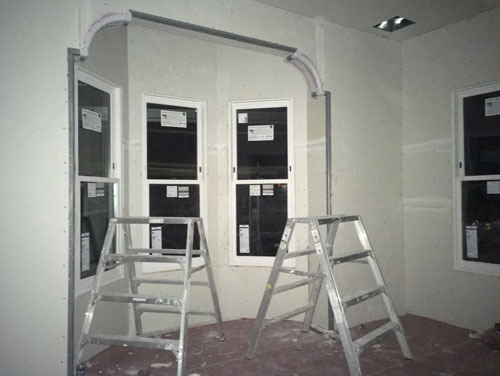 With sprayed in foam insulation, you have to have the wiring in place when you spray, so they left this spot empty and will get back to it. The reason to not just replace the box right now is that it turns out that there are a bunch of guys with power tools working on the house right now and power tools work very poorly without power. Here's the kitchen. Isn't that pink a breath of fresh air? This reminds me that I need to order our appliances, like, right now. And the dining room, which looks a little sad right now. This room will have another gas fireplace in it (yes, I know you love the romance of a real wood fireplace, but this house had coal fireplaces which don't fit a wood fire, and new wood fireplaces are illegal in California, and inadvisable anyway because of how much they contribute to air pollution, plus firewood just means bringing bugs into your house). This room will look better when the wall of built-ins is installed around that sad little fireplace box, and it is all trimmed out. 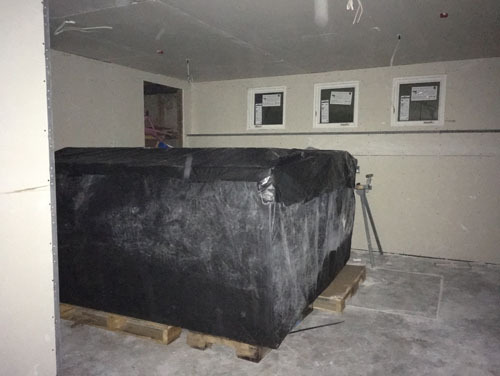 Again, we're waiting on the fireplace install because I was trying to remove as much from this project as possible both to reduce costs and to give us something to live for when the house is finished. A quick pop down to the basement and here is the big workroom. That massive thing there is not a hot tub, but all the wood flooring. It's quite large, but fortunately not as large as I thought was possible. And here's the exercise room. This came out pretty nicely, actually. 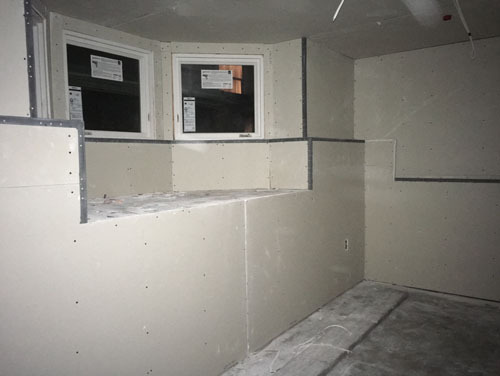 All the weird little lumps and bumps in the walls are working around the foundation, but they will give us a little ledge where we can set a tablet or phone. This is one of the designated no-cats rooms, which is necessary because the cats love my treadmill too much. This never gets old: looking up the elevator shaft. 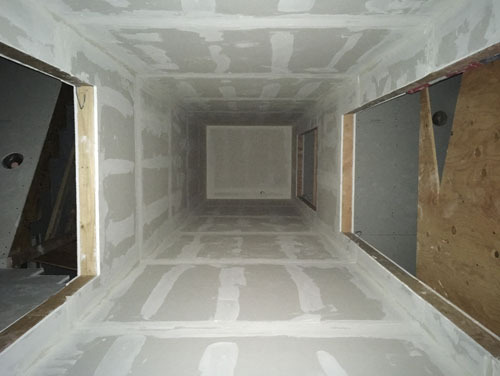 The inside of the shaft is fire-taped to protect the walls from spreading fire around, but not fancy because you won't be able to see the walls unless you are servicing the elevator. 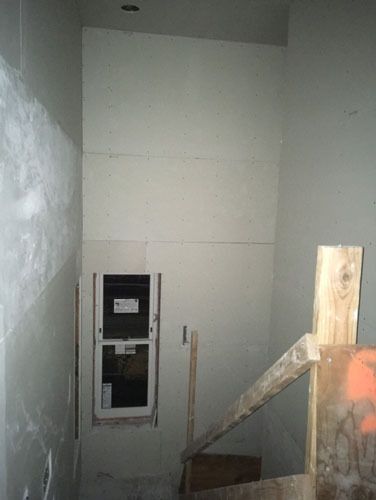 Here is the back stairway. This is one area where I have some design regrets, because I feel like it would be improved by a skylight. However, my sun studies on the house tell me that because this is facing southwest, there will be plenty of sun in here and I do want to hang art here without destroying it, so a skylight probably will not be missed when we're done. This is Bedroom 3, or the bay window bedroom. In this room they've done the rounded corners to match what was existing. I'm undecided on whether to add corbels here. 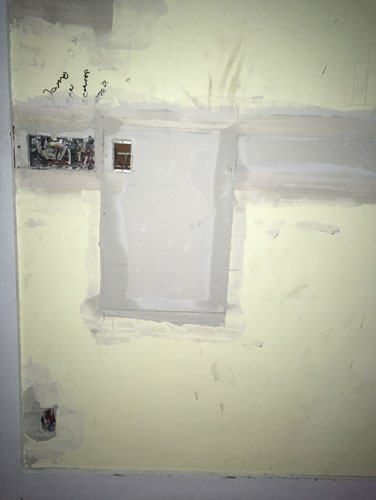 I plan to put some in down in the kitchen, and at the archway in the hall, where there used to be some but they were removed, but in a brand new room I'm not sure what to do. For now, nothing. Fortunately, corbels are super easy to stick on later, because they are just adhered decoration (two dirty words when I was in architecture school). 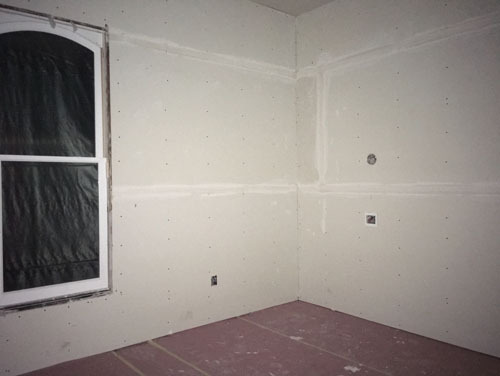 Here's a shot of the wall in the Accordion Room, where the plaster is being patched with drywall. They used an enormous amount of mud in there, which was of great interest to me in my lifelong pursuit of understanding how to repair plaster (oh god I hope never to do this again). In other news, the roof installation has been proceeding very slowly because it keeps raining on the roofers, and this week we even had a thunderstorm which we hardly ever have. In any case, it's not particularly safe to be prancing around on any roof, but especially a metal roof that is the high point of the locality, in a thunderstorm, so they went off to wherever roofers go when it rains. What is the white around the windows, is that permanent finished trim? "new wood fireplaces are illegal in California" Oh, thank you, California. Those of us with asthma worship at your feet. People, I think, have no idea how far wood smoke travels, and no air purifier, despite advertising claims, can filter it out. The white around the windows is the window itself. 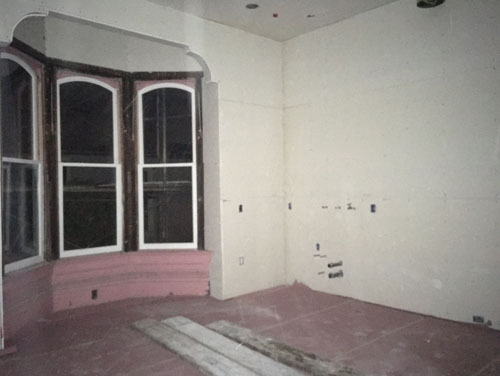 There's the sashes, which are white, and then for the new windows they came in a frame with the operation mechanism inside it, and that is also white. For the existing windows we only got new sashes, so they are in their original wood framing. The trim colour will be white throughout the house, so yes, the final colour is white. And yes, the ban on wood fireplaces is a real boon to asthmatics. The state also regulates all wood burning (including in existing fireplaces, though there are exemptions for people in rural areas who have only wood heat) on certain days ("Spare the Air" days, which are usually in the summer when there is no rain to knock the particulates out of the air). This is also why getting a gas grill makes the most sense here.